KAUKAUNA — An overnight fire destroyed a home on Sullivan Avenue, but the residents were able to escape safely. 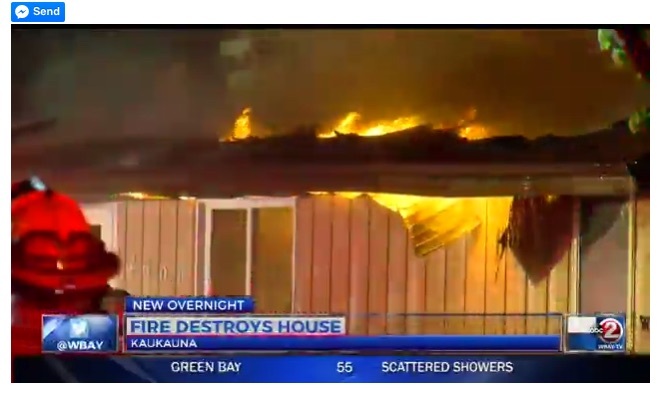 The homeowner was awakened about 1 a.m. Tuesday, May 10, 2016 by smoke alarms and went outside where he discovered fire on the roof, according to WBAY-TV. He told the TV station that he believes the fire started in the attic of the home on the 2700 block of Sullivan. The fire spread quickly and the house sustained significant damage. The fire also reportedly damaged a neighbor’s house, but that resident also was able to get out safely, according to a relative.